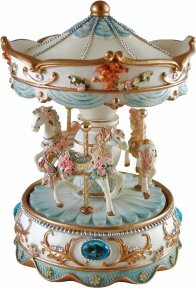 A small, elegant musical carousel from the Distinction Series. This superior collection of musical carousels are individually cast with the finest of detailing and meticulously painted by hand. Enjoy discovering the subtle differences as the carousel turns to reveal the horses individual characteristics, each of which are set into place on a twisted brass rod. A collectible item for the carousel connoisseur. Highly detailed casting, hand painted in muted creams & blues with delicate gold & pearl embellishments. Please be aware that these are not toys. They are made of a fragile cast resin & contain small parts.